Dot Crutches feature clip-lock adjusted handles and push-button adjusted height that allows for quick and easy adjustments. Adult Tall fits patient height 5'10"-6'6" (178-198 cm); adjustable range 52"-60" (132-152 cm). Adult fits patient height 5'1"-5'9" (155-175 cm); adjustable range 44"-52" (112-132 cm). Youth fits patient height 4'6"-5'2" (137-157 cm); adjustable range 37"-45" (94-114 cm). 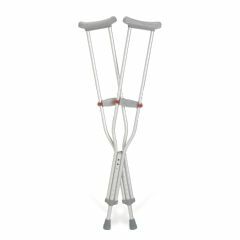 AllegroMedical.com presents The RedÃ²Dot Aluminum Crutches. Red. Dot Crutches feature clip-lock adjusted handles and push-button adjusted height that allows for quick and easy adjustments. Lightweight aluminum. 300-lb. weight capacity. Adult Tall fits patient height 5'10"-6'6" (178-198 cm); adjustable range 52"-60" (132-152 cm). Adult fits patient height 5'1"-5'9" (155-175 cm); adjustable range 44"-52" (112-132 cm). Youth fits patient height 4'6"-5'2" (137-157 cm); adjustable range 37"-45" (94-114 cm).